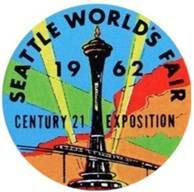 The Seattle World's Fair, or Century 21 Exposition was held in Seattle, Washington in 1962. This site is dedicated to collectors and enthusiasts of the Seattle World's Fair and all of its related memorabilia. 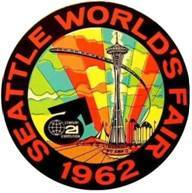 Between April 21 and October 21, 1962, close to 10 million people visited the Seattle World’s Fair. I was 5 years old at the time and for me, the Fair was a magical place, filled with multi-colored lights, wonderful sights and smells and exciting rides. The Space Needle, Monorail and the Gayway were thrilling! Delicious food, fun times, fond memories and collectibles were all available at the Seattle World’s Fair. This site contains Memorabilia, Ephemera, Coins, Medals, Tokens, Pins, Buttons, Posters, Jewelry, Plates, Ashtrays, Cups, Glasses, Spoons, Postcards and First Day Covers, Cachets, Brochures, Advertisements, and all things from the fair. I have done my best to categorize and list these items and what the fair market price for them is. I have collected quite a few items from the fair and have researched their prices for many years. I have tried to be as fair with pricing as possible and to be as complete as possible with this site. I'm sure there are still many items from the Fair that I have not come across. If you would care to send me a picture, description and price, I will be happy to post it on this site. The President officially opened the Fair on April 21st, 1962. 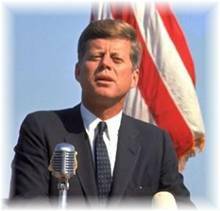 He spoke by telephone from the Michael Paul residence in Palm Beach, Fla., where he and Mrs. Kennedy were spending the Easter holidays. His voice was heard by 12,000 people seated in the stadium on the fairgrounds in Seattle for the opening ceremonies. I AM HONORED to open the Seattle World's fair today. What we show is achieved with great effort in the fields of science, technology and industry. These accomplishments are a bridge which carry us confidently towards the 21st century. Many nations have sent exhibits and will send their people. We welcome them. This exemplifies the spirit of peace and cooperation with which we approach the decades ahead. This manner of opening the fair is in keeping with the exposition's space age theme. Literally we are reaching out through space on the new ocean to a star which we have never seen, to intercept sound in the form of radio waves already ten thousand years old, to start the fair. The sound emanates from Cassiopeia A in the northern sky. Astronomers see only a faint filmy cloud where the entire constellation is located. How different did our globe look ten thousand years ago when that sound started its long voyage? We hope that the light which starts from that star today--ten thousand years later arrives here--will see a happy and a peaceful world. I am confident that as this sound from outer space is utilized to open the fair, the fair in turn will open the doors to further scientific gains by letting all see what has been accomplished today. Before me is a telegraphic key that is of special significance. It has been used by seven Presidents to open great expositions such as the Alaska-Yukon-Pacific Exposition in Seattle in 1909, the Panama Canal, and many others. It was presented to me by your senior Senator Warren Magnuson at the White House last Wednesday. By closing this key may we open not only a great World's fair, may we open an era of peace and understanding among all mankind.